During late Winter and early Spring, the preserves were bustling with activity. The warblers and other migratory birds had arrived. The wading birds and other Florida natives were busy courting, nesting, and caring for their noisy chicks. 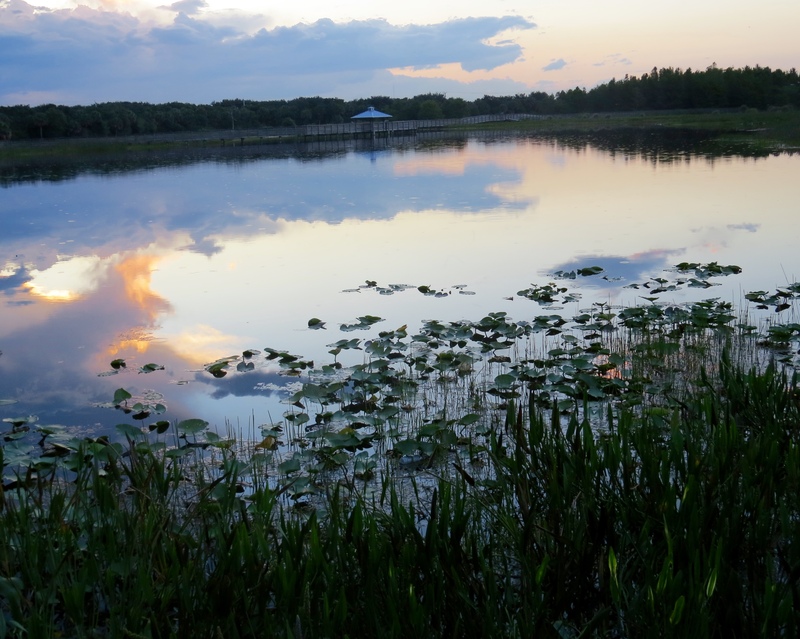 And, the boardwalks were filled with nature-lovers of all kinds, enjoying our spectacular weather and scenery – families with small children, walkers, birders, photographers. But by mid-May, these lovely spaces started quieting down, and an evening walk like the one on which I took these photos, could be a very tranquil time – for birds and people alike. In just another week, Spring will officially turn into Summer, and the preserves will become even quieter and emptier for the next several months. The best time to enjoy a visit will be very early morning, just before the heat of the day – ahhhhh…..heavenly! This entry was posted in Birds, Marsh/Wetlands and tagged Anhinga, Double-crested Cormorant, Limpkin. Bookmark the permalink. The first one is an awesome shot, Bj! 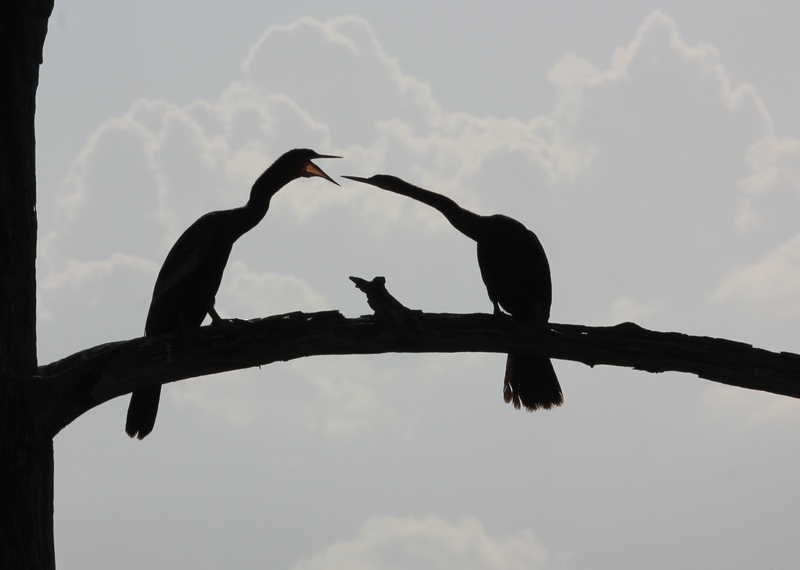 The anhinga pair do look like it is a turf discussion. Cute caption and very cool image. Yep, almost summer! Heat on the way. These photos were taken in mid-May before I went to Israel for a month. Now that we are back, we are having 90° days here in Southeast Florida. That’s HOT! We will be there soon too. Haven’t posted all my pictures from Eilat yet, but it went up to 113° while we were there! Where will you be in Florida? Sorry, I meant our temps will be in the 90’s. I am headed to Maine next. Bit cooler there. I so want to come your way one day. You get the best birds. Yes …. Having spent most of my life in upstate New York, a few hours from you, I am thrilled with birding here in my new home. Enjoy your big event in Toronto and your Maine trip! Thanks! They were amusing to watch 😉 – It’s hard to be sure, but I believe it was a Cormorant on the left berating an Anhinga on the right. The first shot is amazing! Great capture of light and reflections, also. All beauties. Glad you liked them, Lorri. It can be so magical there at that time of day~! Your photography is a joy, Birder. And it’s a great pleasure to follow what interests you. Thank you so very much! It is a joy to be part of this wonderful blogging community. Wow, this does look heavenly, how fortunate for you BJ. 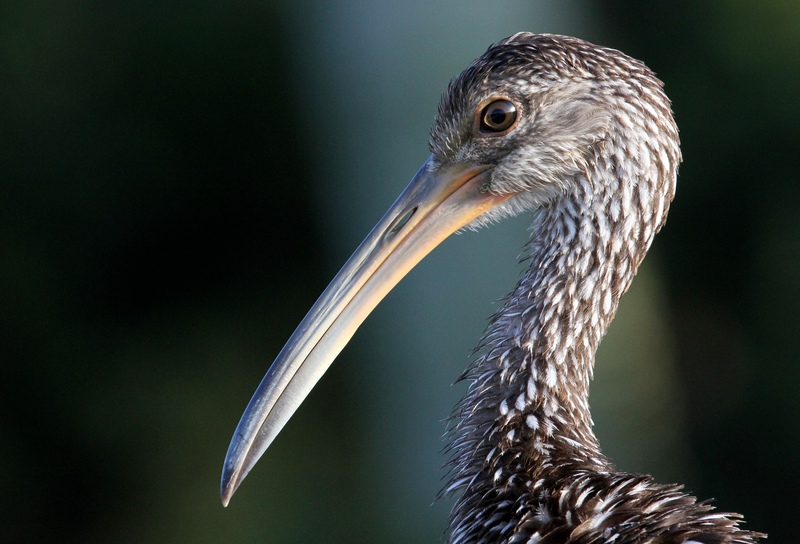 Your close-up of the limpkin is stunning.